Prized for its smooth, white, onion-like caudex. 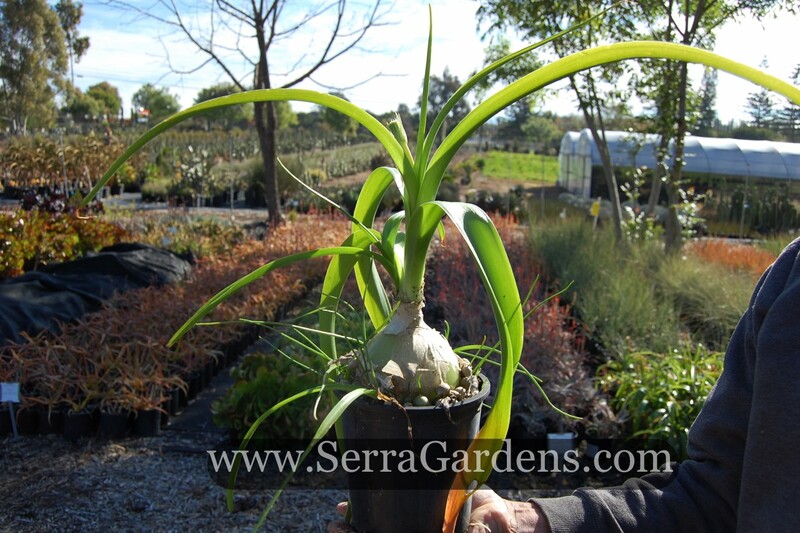 One-gallon plants have 3-4″ diameter bulbs. Very drought tolerant, though it looks better with regular water. A nice interesting container or house plant that needs very little care. Can also be grown in rock, succulent and flower gardens. It can take dry shade as well. Easily propagated from root divisions, removing bubils and replanting them or from seed which often sets when plant is grown outdoors. Ornithogalum caudatum grows from a large bulb at its base. It has long, bright green, strap-like leaves which can reach three feet. It sends out 3-to-5-foot flower spikes with lightly fragrant white and green flowers. These flowers are pretty, but smaller and not as showy as those of other ornithogalums. This is a very easy plant to grow; in fact, nearly foolproof. It takes poor-draining soils and drought in stride. The little bubils which form at the plant's base roll around and spread the plant throughout the garden. It also spreads from seed and can become invasive if untended. If grown in a Mediterranean climate, it dies back to the bulb during the dry season. Note that all parts of the plant are poisonous, and care should be taken to keep bubils away from small children.